Ever feel like ringing a bell requires too much effort? Ever wish you could automate it to ring when something – like a sale – happens? If you responded "yes" to at least one of these questions, fret not. There is now a solution: BellBot. A node.js server hosted on a local machine. An Arduino Uno connected to the machine via USB. A servo connected to the Arduino. The Arduino Uno is a microcontroller board based on the ATmega328P chip. It's a popular board due to its low cost, ease of use, open-source nature, and strong community. We will use it as the interface between our node.js server and the servo. A servo is a device that has an output shaft whose angle can be precisely controlled through an input line. Our servo will be responsible for striking the bell. To do so we attach an arm to the servo's output shaft and align its end with the bell, as seen in the video. Using a pencil for the servo's arm is a fast and easy option for prototyping. A small basic breadboard and some jumper cables are perfect for fast prototyping. In this project we'll be using the power rails to provide common +5V and GND (ground) nodes. We'll be powering the system via USB in this project. Thus, adding smoothing capacitors should help stabilize the circuit and protect against current spikes. A 200uF capacitor works well. Follow the diagram and schematic below to set up the circuit. Connect the servo's Vin to the Arduino's +5V pin. Connect the servo's GND and any of the Arduino's GND pins to a common ground. Connect the servo's control line to one of the digital I/O pins on the Arduino. This tutorial uses pin 8. Add a capacitor or two in parallel to the +5V pin and the common GND to protect against possible current spikes. Remember that capacitors, unlike resistors, add up in parallel. Finally, connect the Arduino to your computer with A USB cable. This will power up the circuit and enable communication with the host computer. Note: If you'd rather power the system through an external power supply, read Using an External Power Supply under the Notes section. The Arduino code will consist of the standard firmata example included in the IDE. The Arduino IDE is the environment in which we write and upload sketch code to the Arduino Uno. You can download the IDE here. In the Arduino IDE, go to File > Examples > Firmata to find the standard firmata code. The code implements a communication protocol between the Arduino and any host computer. With this protocol and the Johnny Five module, we can control the Arduino within node.js. Finally, upload the sketch to the Arduino. 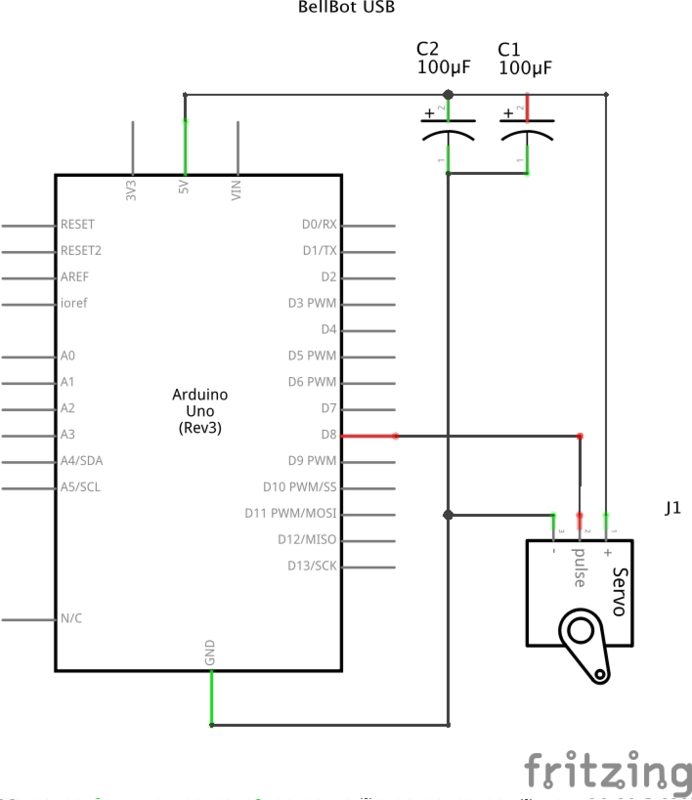 Writing our own Arduino sketch to control the servo is also an option. But, we would lose the abstraction and simplicity of controlling the hardware within node.js. Checkout Sketch code under the Notes section if you're interested in writing your own Arduino code. If you haven't already, download Node.js here. Once node.js is installed, run the following command in your project's directory to create a new package.json file. This file maintains info about the project and its dependencies. Next, install the following node modules into the auto-generated local node_modules folder. By including the --save option in the following commands, npm updates package.json automatically. 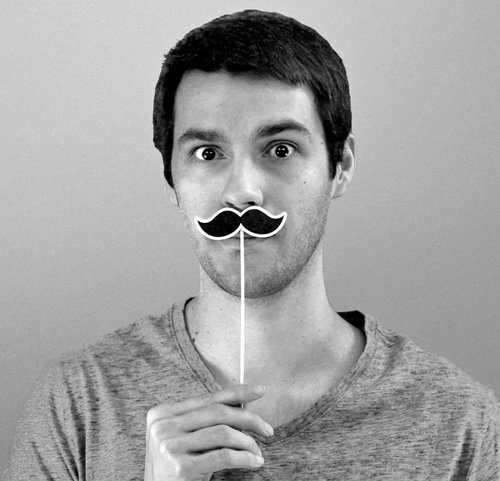 express - A popular framework we will use to set up a web server. npm will look at the package.json file and install all the required modules. start - the starting and resting angle of the servo arm. Default: 75.
sdelay - the amount of time in milliseconds to wait before resetting the servo's arm after it has struck the bell. Default: 500. If the BELLBOT_KEY environment variable exists and no key is supplied in the arguments, the server will authenticate incoming requests using the BELLBOT_KEY. 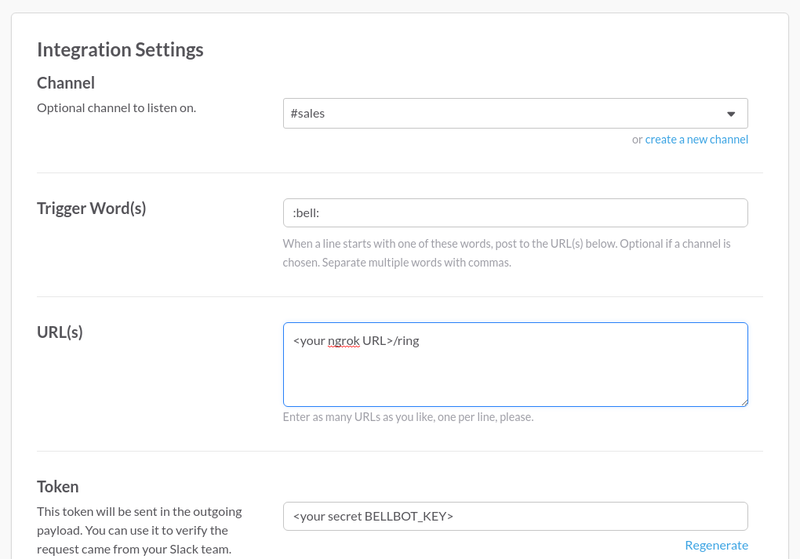 We explain how to set up a BELLBOT_KEY later. 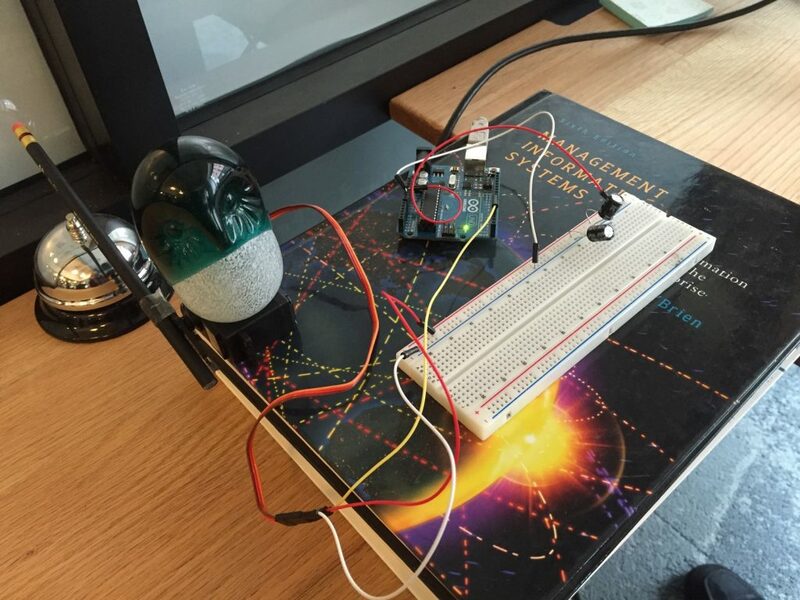 This module creates an object that describes the BellBot's behavior. It uses our args.js module to override default settings. Note that the URL is initially blank. We later set this URL to the unique public URL that ngrok supplies us. This module provides a constructor for a servo controller. Note that the controller's timeout property corresponds to the processing delay – that is, the delay between sending requested commands. Require's all the needed components. Starts up an ngrok process. to source the newly added environment variable. Next time you start your BellBot server, it will authenticate requests with that specified password. The incoming POST requests must have a key or token body parameter that matches the password. Use curl or a program like Postman to build and send test POST requests. If you are authenticating requests, pass token: as a body parameter. Test locally by sending POST requests to localhost from your machine. Next, verify that the public address supplied by ngrok is hitting your local server by using the ngrok URL as the POST destination. A neat way to automate bell-ringing is to use Slack. In slack, you can add and configure outgoing webhooks. For example, let's add a webhook that sends a customized POST request whenever a message beginning with :bell: comes in. Create a new outgoing webhook: Apps & Integrations > Manage > Custom Integrations > Outgoing WebHooks > Add Configuration. Select the slack channel that the webhook will be listening in. For example, a "sales" or "bots" channel. Set the trigger word that will cause the POST request to be sent. For example, the :bell: emoji. Set the URL to the public ngrok URL that maps to your local server. If your BellBot is configured to require authentication, set the Token to your secret BELLBOT_KEY. Now all that's left is to make sure that the specified channel receives an automated message that triggers the webhook whenever a sale occurs. A sales Slack channel that listens for incoming :bell: messages. A servo uses error-sensing negative feedback to correct and maintain its shaft's angle. The signal sent to the input is a PWM voltage signal. The width of the pulse is what controls the angle of the shaft. Check out this Seattle Robotics guide for more details. Servos are notorious for drawing lots of power. When using USB power only, the 5V output on the Arduino is what powers the servo.The high current drawn during the servo's rotation may exceed the limits of the USB ports (often ~500mA at 5V). When the current exceeds this threshold, the host computer may disable the port. Additionally, the Arduino may reset and behave erratically due to voltage sags. Check the servo's data sheet for its idle, running, and stall currents. You want them to be low enough to be supplied via USB. Adding a capacitor in parallel to the 5V output and ground can help protect against these undesired effects. To avoid these concerns altogether, follow the diagram and schematic below to set up an externally-powered BellBot. Power the servo and Arduino through an external power supply. Four AA 1.5V batteries provides ~6V, which should be enough to power both components reliably. Connect the voltage source's output to the Vin input on the Arduino. Connect the voltage source's output to the Vin of the servo. Connect the voltage source, servo, and Arduino to a common ground. Connet the servo's control line to one of the digital I/O pins on the Arduino. Connect the Arduino to your computer using a USB cable. The USB connection's role is reduced to serial communication. The Arduino will use the battery power as long as it's switched on, even when the USB is connected. 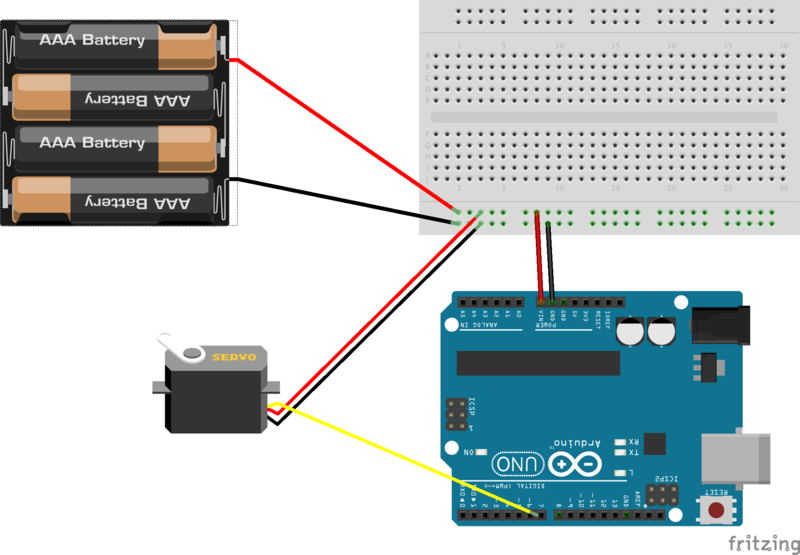 If you switch off the battery, the USB connection will power the Arduino but not the servo. Diagram for BellBot running on an External Power Supply. 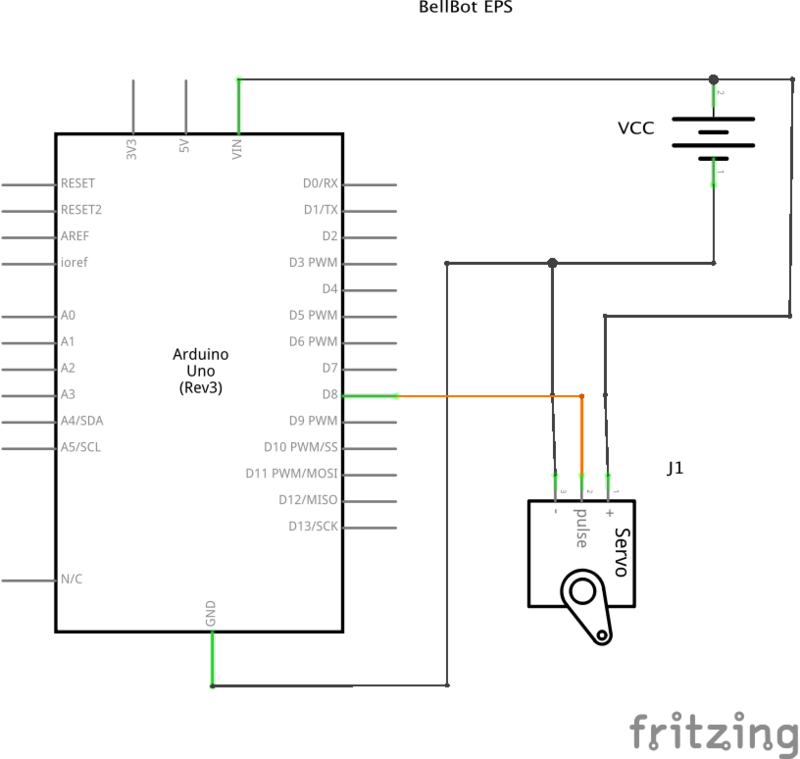 Schematic for BellBot running on an External Power Supply. An alternative option for BellBot's software is to write your own Arduino code. For example, the following sketch listens for the 'R' character to ring the bell. The node.js server code would need refactoring. It would no longer require the whole Johnny Five module, and would use just the Serialport module to send data to the Arduino in a more barebones fashion. More routes to your express server would expand the possible types of requests. For example, a /sweep route could cause the servo to begin sweeping. Or, if there are many bells and servos, a REST API could allow a user to control each servo. A web app or mobile phone app for this project could allow users to monitor or control the states of the servos. Admins or users could analyze or act on statistics and data logs of requests. LEDs could light up whenever the servo is working or a request comes in. A network of servos could handle different types of requests. Light sensors could control the operation state of the servos (on if the lights are on). These are just some ideas! Rather than exposing the system as a prototype, you could build a professional PCB and enclosure to abstract away the system. It should be straightforward to port this project to a Raspberry Pi. The node.js server would run on the Pi itself, with the servo connected to its GPIO pins. No USB connection would be necessary.